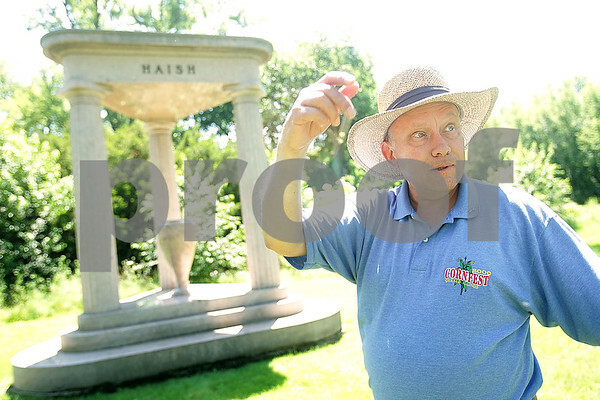 Historian Steve Bigolin explains the history behind Jacob Haish's nearly 20 foot tall headstone in Fairview Park Cemetery in DeKalb on Monday, July 7, 2014. At the time of the headstone design, the main entrance to the cemetery was designed to be a winding road off of 1st St. and was later changed to have the current entrance on 4th St. in DeKalb. The barbed-wire baron originally bought the plot thinking his plot would be the first seen upon entering the cemetery, as Joseph Glidden and Issac Ellwood, are both buried in the same cemetery. Haish also had his headstone design copyrighted in 1928 by Robert Trigg & Sons, of Rockford, so no one could copy the design.